With Readly you can read Coding Academy and thousands of other magazines on your tablet and smartphone. Get access to all with just one subscription. New releases and back issues – all included. "Whether you’re a dyed-in-the-wool coding type or a beginner hoping to get started and produce your first programming projects, there should be something for you in this newly revised 164-page guide. This book is principally focused on Python, but also covers other programming languages, including Rust, Swift and Go. 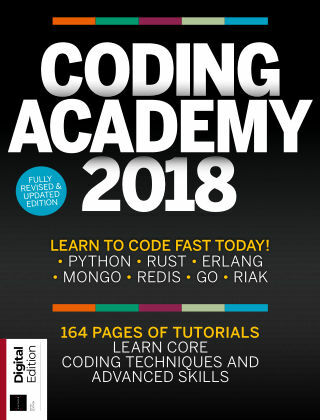 Coding basics - Using Python, we’ll take you through essential coding steps Python projects - Fun projects to take your skills further, including making scripts and games Databases - Manage your data efficiently and learn the ins and outs of SQL Do more - Go beyond Python with programming languages like Rust, Swift and Go"